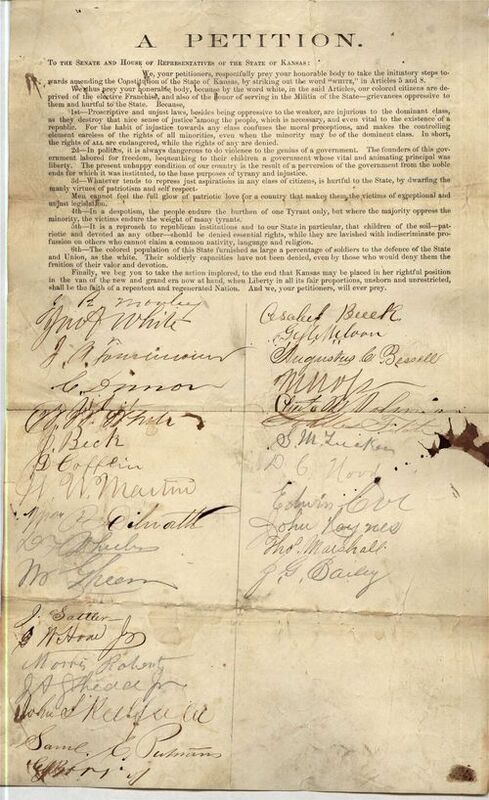 This petition by an unknown group of Kansas residents asks the state legislature to support suffrage for black males. The petitioners support removing the word "white" from articles five and eight of the state constitution. At that time the Kansas constitution limited suffrage to white males. The petition outlines six reasons why suffrage should be extended to black males. In 1867, the state legislature approved an amendment supporting black male suffrage but white male voters defeated the amendment in a public referendum. Voters also defeated a similar amendment supporting white, female suffrage. These proposed amendments followed the Kansas legislature's ratification of the Fourteenth Amendment to the U. S. Constitution, which defined who were citizens, including Negroes.